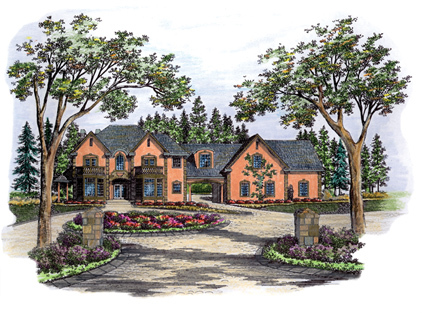 The design of this three-bedroom, European-style home entices with a commanding elevation. The one-of-a-kind, drive-through porte cochere leads to a private motor court where a guest house/garage suite creates intimacy and privacy. A brick-walled country porch greets visitors. The foyer provides panoramic views into the great room and den and dining areas. The kitchen has a large island and walk-in pantry. Windows on three sides surround the breakfast nook. A half bath, powder room, wet bar, and utility room complete the main level. Upstairs, the master suite features a balcony and a full bath with large corner tub with windows, a freestanding shower, and two vanities. There is also a walk-in closet for ample storage space. Two additional exquisitely appointed bedrooms each feature a window seat and walk-in closet. The second floor also boasts two additional full baths.